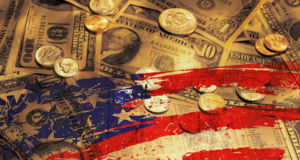 The US dollar staged a remarkable comeback on Thursday, advancing against a basket of six major currencies to recoup all the losses it recorded following the Fed meeting, even without any positive US catalyst or news. What is particularly striking, is that US Treasury yields were little changed, which implies that traders haven’t changed their mind about the US outlook or monetary policy, bur rather that the dollar’s rebound may have been owed primarily to weakness in other currencies (see below). Meanwhile, US stock markets closed firmly in the green, with the S&P 500 adding 1.09% to touch highs last seen in early October. The trigger wasn’t clear, but it may have been a combination of looser financial conditions after the Fed’s dovish pivot, and renewed optimism around trade following some encouraging reports. Specifically, that Trump simply wants China to ‘double or triple’ the amount of US goods it has offered to buy as a means to eliminate the bilateral trade deficit – a condition that if met could ‘seal the deal’. China has already shown on several occasions it’s comfortable going down this road and purchasing US goods, but is less willing to make the structural reforms that US officials like Lighthizer are advocating. Hence, if Trump is indeed willing to ‘settle’ for goods purchases, then a near-term deal may well be in store. The British currency remained in the spotlight yesterday, recording hefty losses during the early European session as uncertainty over what happens next in the Brexit saga mounted. While the pound was still the worst performer among the G10 currencies, it did manage to recover a good chunk of its losses later on as the tone by EU officials on an extension seemed more constructive. The euro was also on the back foot, seemingly in sympathy to the pound, while the BoE meeting proved to be a non-event. The EU offered a short no-strings-attached extension until April 12, with the prospect of extending it until May 22 if UK lawmakers vote for PM May’s deal in the next three weeks. Otherwise, it will either be a no-deal exit on April 12 or the UK will probably need to participate in the upcoming EU Parliament elections and get a much longer delay, of perhaps two years. As for the pound, uncertainty will remain elevated as April 12 draws nearer, implying that the near-term risks still seem tilted to the downside, particularly since May’s deal will probably be rejected again. The caveat is that any signs for a long extension could trigger a meaningful rebound. 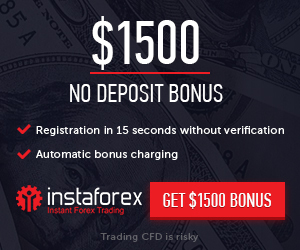 The single European currency took a significant hit in early European trading on Friday, after Germany’s preliminary manufacturing PMI for March collapsed deeper into contractionary territory. The print fell to 44.7 from 47.6 in February, missing the forecast for a slight rebound. This is particularly worrisome as it implies that euro area growth may have slowed even further in Q1, and amplifies the risk that deteriorating sentiment in manufacturing could spill over and ‘infect’ the so-far resilient services sector. Overall, these vindicate the ECB’s ‘shock and awe’ decision to push back the timing of its first rate increase, and increase the likelihood that even further stimulus may be considered before long, spelling downside risks for the euro. 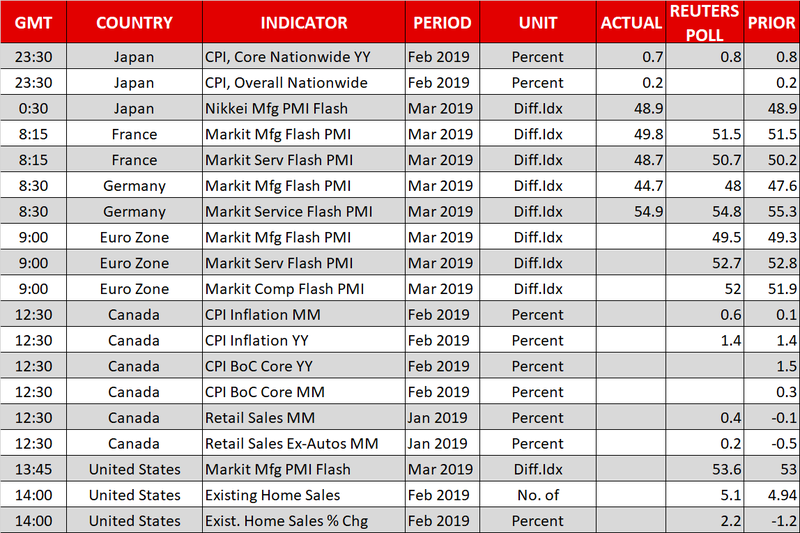 The main releases left on the economic calendar for today are from Canada, which will be on the receiving end of inflation and retail sales figures for February and January respectively. In the US, preliminary Markit manufacturing and services PMIs for March will be in focus.